RS Aggarwal Solutions for Class 6 Math Chapter 18 Circles are provided here with simple step-by-step explanations. These solutions for Circles are extremely popular among class 6 students for Math Circles Solutions come handy for quickly completing your homework and preparing for exams. All questions and answers from the RS Aggarwal Book of class 6 Math Chapter 18 are provided here for you for free. You will also love the ad-free experience on Meritnation’s RS Aggarwal Solutions. All RS Aggarwal Solutions for class 6 Math are prepared by experts and are 100% accurate. Take a point O on your notebook and draw circles of radii 4 cm, 5.3 cm and 6.2 cm, each having the same centre O. This is the required diagram as asked in the question. Draw a circle with centre C and radius 4.5 cm. Mark points P, Q, R such taht P lies in the interior of the circle, Q lies on the circle, and R lies in the exterior of the circle. 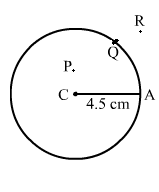 Draw a circle with centre O and radius 4 cm. Draw a chord AB of the circle. Indicate by marking points X and Y, the minor arc AXB and the major arc AYB of the circle. (i) Each radius of a circle is also a chord of the circle. (ii) Each diameter of a circle is also a chord of the circle. (iii) The centre of a circle bisects each chord of the circle. (iv) A secant of a circle is a segment having its end points on the circle. (v) A chord of a circle is a segment having its end points on teh circle. Diameter of a circle is a chord of the circle, not radius. It is the longest chord of the circle. A perpendicular drawn from the centre of the circle to the chord, bisects the chord. It is a line passing through the circle that intersects the circle at two points. Draw a circle with centre O and radius 3.7 cm. 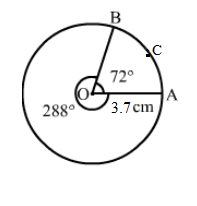 Draw a sector having the angle 72°. Therefore, the required arc is arc OACB. Fill in the blanks by using <, >, = or ≤. (i) OP ...... OQ, where O is the centre of the circle, P lies on the circle and Q is in the interior of the circle. (ii) OP ...... OR, where O is the centre of the circle, P lies on the circle and R lies in the exterior of the circle. (iii) Major arc ...... minor arc of the circle. (iv) Major arc ...... semicircumference of the circle. This is because the major arc covers more than half of the circumference of the circle. (i) A diameter of a circle is a chord that .......... the centre. (ii) A radius of a circle is a line segment with one end point ........... and the other end point ...... .
(iii) If we join any two points of a circle by a line segment, we obtain a ........... of the circle. (iv) Any part of a circle is called an ........... of the circle. (v) The figure bounded by an arc and the two radii joining the end points of the arc with the centre is called a ........... of the circle. (i) A closed figure is a figure that can be traced with the same starting and ending points, and that too without crossing or retracing any part of the figure. For example: Polygon, circle, etc. (ii) A figure having no boundary and no starting or ending points is called as an open figure. (iii) A polygon is a plane shape with 3 or more straight sides. It is a 2 dimensional closed figure. (a) A triangle having no sides or angles equal is called a scalene triangle. (b) A triangle having two sides and the corresponding opposite angles equal is called an isosceles triangle. (c) A triangle having one of the angles more than 90° is called an obtuse triangle. (i) What do you mean by a convex quadrilateral? (ii) Define a regular polygon. (i) A quadrilateral with no interior angles greater than 180° is known as a convex quadrilateral. (ii) A regular polygon is a polygon all of whose sides are of the same lengths and all of whose interior angles are of the same measures. The angles of a triangle are in the ratio 3 : 5 : 7. Find the measures of these angles. The angles are in ratio 3:5:7. Suppose the angles are 3x, 5x and 7x. Therefore, the angles are of the measures 36°, 60° and 84°. The angles of a quadrilateral are in the ratio 2 : 3 : 4 : 6. Find the measures of these angles. Suppose the angles are 2x, 3x, 4x, and 6x. We know that the sum of the angles of a quadrilateral is 360°. Therefore, the measures of the angles are 48°, 72°, 96° and 144°. State the properties of a rhombus. A rhombus is a parallelogram whose opposite sides are parallel. All four of its sides are equal in length. Also, the opposite angles are equal. The diagonals bisect each other at right angles. Define (i) a trapezium (ii) a kite. (i) A trapezium is a quadrilateral with only one pair of parallel sides. (ii) A kite is a quadrilateral that has two pairs of equal adjacent sides, but unequal opposite sides. Draw a circle with centre O and radius 3 cm. Draw a sector having an angle of 54°. Since one base angle is 70°, the other base angle will also be 70° because the triangle is isosceles. (i) The diagonals of a rhombus are equal. (ii) The diagonals of a parallelogram bisect each other. (iii) The centre of a circle bisects each chord of a circle. 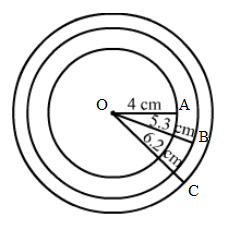 (iv) Each diameter of a circle is a chord of the circle. (v) The diagonals of a rhombus bisect each other at right angles. Diagonals are perpendicular and bisect each other. A perpendicular drawn from the centre of a circle to the chord, bisects the chord. It divides the circle in two equal parts. The diagonals of a rhombus bisect each other at right angles.